It was the apricots, appearing in a multitude of different forms, that surprised me. I had long been wanting to explore the Wachau, in a gorgeous situation on the Danube river, and Austria’s finest wine region for high quality dry, white wines from Riesling and Grüner Veltliner. Yet as ever, when you finally visit somewhere you know only virtually, there is always something unexpected in store. On our first morning we drove alongside the river from Spitz, where we were staying, to explore the very sweet and colourful village of Dürnstein, perhaps the most famous of the Wachau wine region, very busy in summer, but calm mid-week in October. 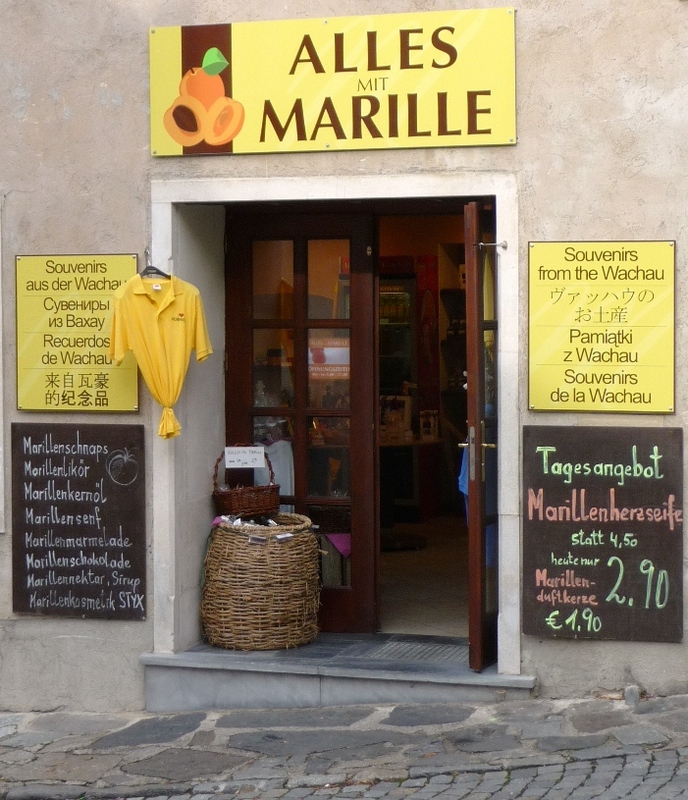 I was expecting wine bars and wine producers, but everywhere in shops and restaurants, there were references to Marille, a German word I’d never heard before. It turns out that Marille is the word used in Austria, South Tirol and Bavaria for apricots, and recognising the traditions of growing apricots particularly in this region, Wachauer Marille is a protected appellation, with 250ha of apricot trees grown here. 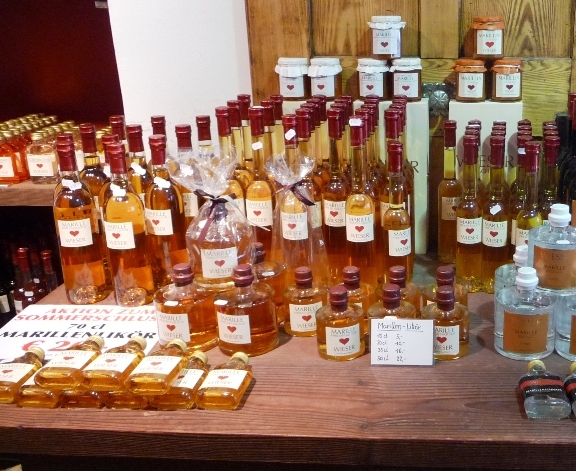 Shops sell the apricots bottled and made into a really wide range of products including jam, compote, fiery schnapps and sweet liqueurs – a yellow theme pervades. On menus, Marille appears in many guises including as dumplings or the delicious Marillenpalatschinke – apricot pancakes. A little away from the centre of Dürnstein is Domäne Wachau, the regional wine cooperative. One of the most respected wine cooperatives, not just in Austria but in Europe, it accounts for about one-third of the output of Wachau wines and is one of the largest wineries in Austria. If you come to the Wachau, this is an ideal first visit for three reasons: in its great location on the site of an old abbey winery you will find an excellent winery shop open every day all year, a beautiful Baroque palace and cellar, and you should receive a very thorough introduction to the wines of Wachau. 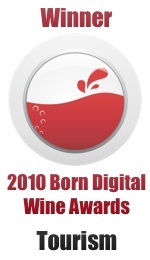 Oh, yes, and there’s a superb range of nervy, dry white, food-friendly wines too! We were lucky to meet the dynamic manager and Master of Wine Roman Horvarth together with experienced cellarmaster and oenologist Heinz Fischengruber. There are two main lessons to be learnt in the Wachau. Firstly, about the climate that varies in particular between the cooler vineyards in the west, more influenced by the far-off Atlantic, and those significantly warmer vineyards in the east towards the town of Krems, which have influence from the Pannonian plain with warm winds funnelled up the Danube river. Within this, there are a multitude of microclimates due to the varying steepness, terraces and aspects of the vineyards, and varied soil types too. As a large cooperative, Domäne Wachau has several wine ranges. The mid-range named Terassen (from grapes grown on the steep terraced vineyards) exists for Steinfeder, Federspiel and Smaragd in both Grüner and Riesling, and provides excellent representatives of each style. For greater individuality the higher quality, single vineyard wines (mainly at Federspiel and Smaragd levels) show the wide range of great vineyard sites in which members of this wine cooperative have holdings. They include many classic vineyard names of Wachau including from west to east along the valley 1000 Eimer Berg (in the village of Spitz), Achleiten (in Weissenkirchen) and Loibenberg (in Dürnstein). The cooperative has invested quite heavily into wine tourism and frankly admits that this is very cost intensive, but is convinced that for its worldwide reputation it is worth it. The shop, where you can taste of course, is well worth a visit, and if you can arrange a tour of their cellars and beautiful restored palace as well, this is something really special. The Wachau region, designated as a UNESCO World Heritage Site since 2000, is around 1000km from the source of the Danube, one of Europe’s most important rivers, and about 1400km from its end in the Black Sea. With a history back to Roman times (the Danube was the northern limit of the Roman empire) the vineyards are on the steep sides of the river, in parts on both sides, and also up the side valley running west from the village of Spitz, where we visited the excellent family winery Weingut Johann Donabaum (one of six producers with the last name Donabaum!). Since he took over from his father, Johann Donabaum has put the estate on the map, expanding the vineyard holdings and improving wine quality greatly. Typical of the region, he grows 60% Grüner Veltliner, 35% Riesling and 5% of mix of other grapes (we tasted a good grapey, dry Muscateller and a medium sweet, spicy Neuburger). At present he uses no wood for maturation, but may do in future for his Smaragd wines. Tasting in a lovely cellar tasting room, we loved the wines as they are, especially the Riesling Offenberg Smaragd, grown here on a slate soil, to me reminiscent of German Rheingau Rieslings. 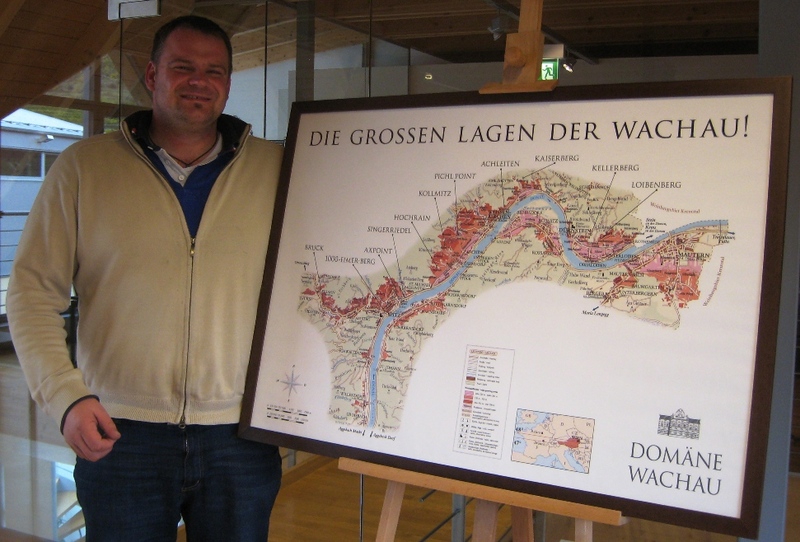 One way of understanding the geography of the Wachau is to take a leisurely drive criss-crossing the river Danube. There is a bridge at the western end at Melk, the best route into the region driving the 90 minutes from Vienna, and another in the east at Mautern, but there are delightful, slow car ferries pulled by overhead cables – at the villages of Spitz, Weissenkirchen and Dürnstein – and it’s well worth at least one journey on the ferry. 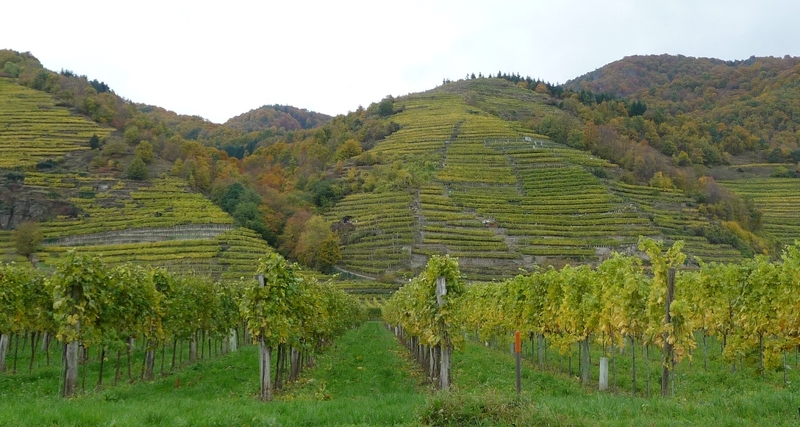 The village of Weissenkirchen is home to some of the finest wine producers in the Wachau. As in much of the region, many are open to visitors only by appointment. We had an appointment at the winery owned by the understated Roman Jäger, who at certain times of the year operates a Heurige wine bar. Jäger owns plots in some of the prime vineyard sites. I was developing a taste for wines from the Achleiten vineyard, and here was a full, spicy and peppery Grüner Smaragd 2009 that was delicious. To understand the scale here, Jäger owns 3 parcels of vines in this vineyard, about 1ha (2.5 acres) in all, out of a total 20ha for the Achleiten vineyard. We also took the opportunity to take a walk up through the vineyards on the edge of Weissenkirchen, high above the river. 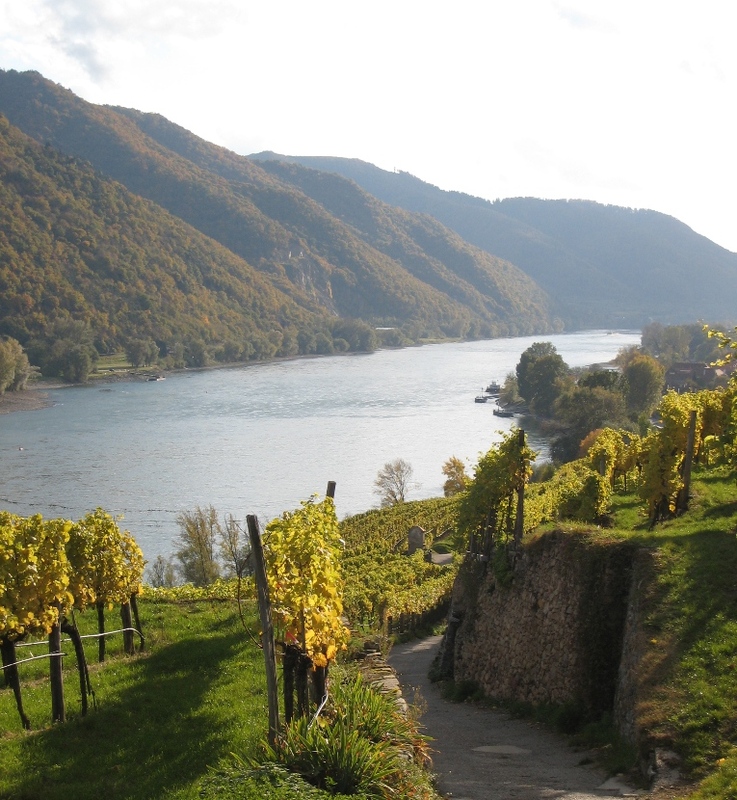 There are well-marked vineyard walks throughout the Wachau, ideal to take a picnic, or to work off a good lunch. Food and wine matching is almost inevitable everywhere in the Wachau, whether in a simple café like the Altes Presshaus (old press house) in Dürnstein, with soups and snacks, offered with decent wines by the 1/8 litre; or in the typical Austrian wine region Heurige (we enjoyed two evenings at the Lagler Heurige, walking distance from our hotel in Spitz); or at the gastronomic level, such as offered by the restaurant owned by Weingut Jamek in Joching, who also have an upmarket hotel. How lovely it was to find a wide range of wines by the glass and by the bottle at reasonable prices at whatever type of eating establishment we chose, and how well the dry Rieslings and Grüner Veltliners matched the wide range of food. At the very traditional Gasthof Prankl in Spitz one evening we drank a gorgeous, minerally Grüner Felderspiel 09 from the well-respected Spitz grower Franz Hirtzberger, available for 28€ a bottle and working brilliantly with my medallions of pork with Veltliner crust and mushroom risotto. At the Jamek restaurant, I gave a toast to the late Graf Matuschka of Schloss Vollrads in Germany, from whom I learnt that wines should be matched to the strongest flavour in the meal, usually the sauce. Here, we compared a glass of Ried Klaus Riesling Federspiel with a Smaragd from the same vineyard, both 2009. Initially surprising, the former was ideal with Brett’s Steakburger with noodles and mushrooms sauce, but could not cope with my zander (fish) and paprika cabbage; of course, the reverse was true with the Smaragd, which as the bigger wine could deal with the paprika – lesson confirmed. The Hotel Ulrike where we stayed was a simple family one, of which the Wachau has plenty – it reminded me of a good Logis de France style of hotel. Home-made Marillen jam was on offer with breakfast of course, and when we talked with our helpful hostess about the Marillen, she immediately asked if we had a little longer to enjoy breakfast, and when we said we could, she rustled up a gorgeous plate of warm apricots, wrapped in bacon – a great start to the day. Thanks to our hosts, in particular at Domäne Wachau, who also supported the European Wine Bloggers Conference, which encouraged us to Austria in the first place, and to Julia Sevenich, who gave us excellent recommendations and help to plan our two days in the Wachau, especially an introduction to the wonderful grower Rudi Pichler, where we enjoyed a special visit and tasting beyond the scope of this article. This entry was posted on Thursday, June 30th, 2011 at 7:36 am and is filed under Places to Stay, Eat and Shop, Vineyard Visits. You can follow any responses to this entry through the RSS 2.0 feed. Both comments and pings are currently closed. 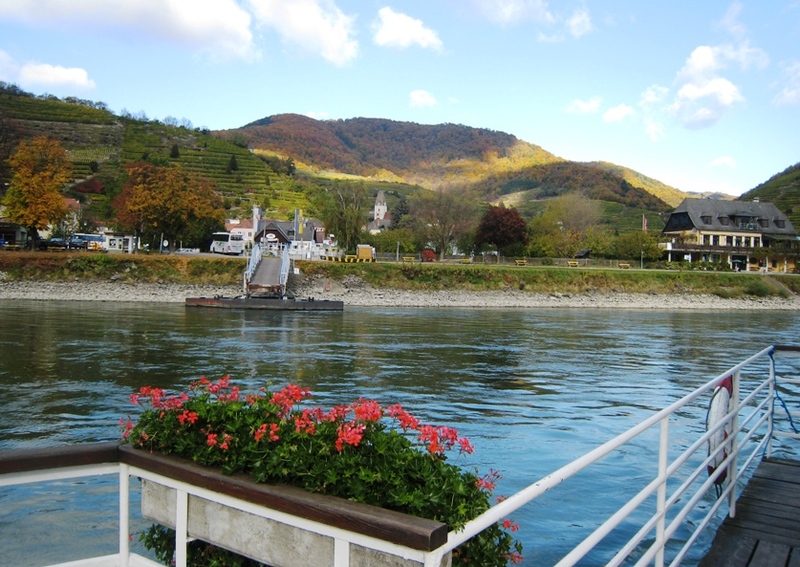 Takes me back to when I used to live in Vienna and we would travel up to the Wachau regularly for a stroll through the vineyards and, yes, a ferry across the river. Did you get to check out the beautiful baroque abbey in Melk, too ? It’s breathtaking. Thanks Tom, we definitely need to go back to see the abbey and many other things we missed on our short visit – so many great wine producers to visit too! Wow, nice blog and wine country photos. It’s inspired me to visit areas I never imagined. Can’t wait to visit, sip wines and collect wine corks.